How can it be that we are in the second week of September already? In my mind, it is still Summer and we should be planning days out and eating ice-cream. Instead I find that school is back and the familiar routines are taking precedent over fun, lazy days. I hope you all had a great break from school and your little ones went skipping back into the playground as happily as mine did. They were excited to see their friends and teachers again. The last couple of weeks of August were filled with checklists and shopping trips for us. I managed to plan ahead so that I could sew some of the items. The weather wasn't great so the girls didn't mind stopping inside while I got stuck into my sewing patterns! Instead of a regular pencil case, we decided to make something with a bit more capacity for pens, pencils, highlighters, crayons, felt tips, rubbers, rulers, glue stick, and all those other trinkets you collect during a term. I used the Dopp Kit from the Portside Travel Set by Grainline Studio. It is essentially a wash bag, but the room inside makes it the ideal size. The zippered pocket on the outside will come in useful (I actually stuffed some hair bobbles in there for her) and the side handle means it is easy to pull out of her bag. Red is her favourite colour and we settled on some cross-weave canvas as the main fabric. It is nice and sturdy and holds up well. I did interface the pieces as directed to give extra structure to the bag. The pattern is well written and I would certainly recomend it. I can see me making these as Christmas presents for my husband and father as I never know what to get them. My dad loves a good wash bag! A last minute addition to the school sewing was an art apron. I once borrowed a book from the library containing a selection of aprons/bib patterns for adults and children. I traced a couple of them off and among them was this simple apron. Perfect for a quick sewing project and thank goodness I had a supply of bias binding to hand. I managed to make this without having to run to the shops for anything. The fabric is by Riley Blake and is a quilting cotton. I cut another piece out of plain white cotton and sandwiched the two together to make it thicker. The next time I see it, it will be plastered in paint so for now here is a photo of it looking pristine! My practice run with a school shirt pattern gave me the insight I needed to add some extra length to this blouse pattern. I ended up adding 1 1/4" to the body. It might not have been enough but I was mindful of keeping the nice curve and if she has to tuck it into her trousers, I didn't want a puddle of fabric around her bottom. The blouse pattern is McCalls 6951 and I used white polycotton. The skirt is a Simplicity pattern (4264) and is really simple to put together. There are basically two rectangles and the waist elastic is looped and secured into the foldline of the waist yoke before the bottom skirt is added. 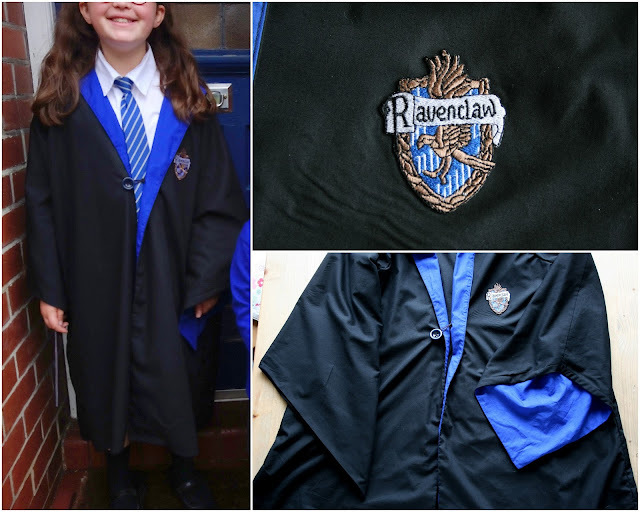 I did a bit of searching online and thanks to the magic of Pinterest I discovered a pattern for Hogwarts robes that somebody had self-drafted and loaded onto the Burda Style website. I only had line drawings to go off but the methods for measuring out the lines were well explained and I got there in the end. The only thing I struggled with were the angles of the sleeves. There was no guideline so I had to draw them in by eye. I did have to fudge them into the armsyce and I suspect my drafting wasn't perfect. But looking at it you would never know. I wasn't the only one who contributed to this outfit. I would just like to add that my husband stood in the kitchen colouring in a chopstick with a black Sharpie marker so that the outfit would be complete! Good man! So much pretty sewing sewing. That blouse is lovely, I adore the wee cap sleeve. The skirt and blouse combination is very snappy but that cape, it is awesome. I suspect the robes will be worn many times, and for years to come in the dress up box. A worthy sewing project! They do such fun things at school with the girls. Thank you! The dopp kit was so difficult to photograph properly that I gave up trying. It was fun to make though!